Purple veggies are not only tasty additions and enhancements to your meal – but they also make for a lovely garden which when harvested yields multiple benefits and rewards. Ever tried pasta with purple cauliflower and walnut cream sauce? Thinking of starting a vegetable garden? Why not start with the color purple? 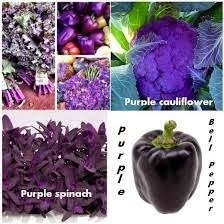 Bell peppers, jalapeno peppers, spinach, asparagus, cauliflower, and carrots all come in purple!